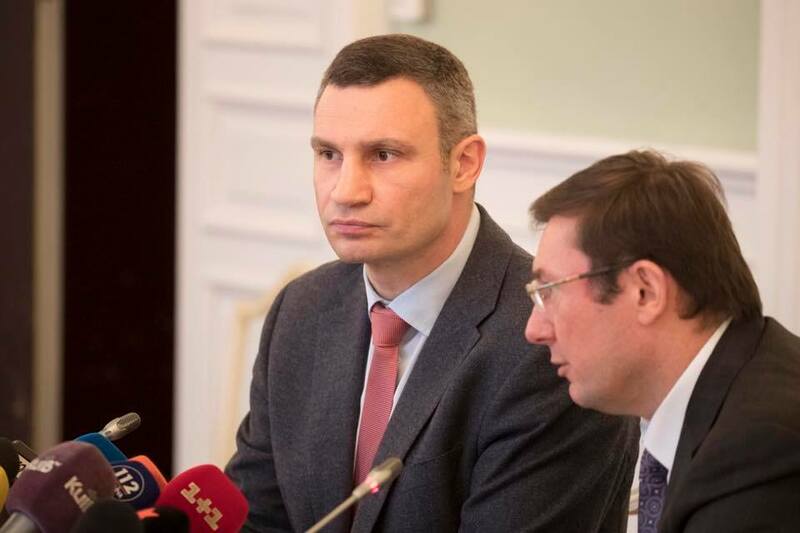 Kyiv Mayor Vitaly Klitschko and Prosecutor General of Ukraine Yuriy Lutsenko on Wednesday held a joint meeting on the situation in the trade kiosks in Ukraine’s capital and agreed on cooperation of city authorities and the prosecutor's office to ensure effective demolition of illegal kiosks. Klitschko said that the city administration has on its website an online map of legal kiosks, the owners of which pay money to the city budget. He emphasized that over a year ago, the lists of illegal trade stalls, which have to be dismantled, were published lists that are to be dismantled, and their owners have received the relevant notices. "I am pleased that we have agreed today on the interaction between different branches of government that is transparent, to withdraw the illegal constructions from city streets in a legal and open way. The problem with the kiosks is acute. Our task is to restore order and organize trade. For example, 30% of retail space on Khreshchatyk Streer, where it is possible to conduct legitimate trade, has not been leased. One-third of a total number of trading locations on the municipal market has been empty. Of course, it is easier to seize some land and put up and illegal kiosk, without paying anything. But this is how the legitimate businesses are being killed!,” Klitschko said. “We presented a map of legitimate kiosks – it is publicly available. We protect honest businesses that bring money to the budget and work legally. And we remove illegal kiosks. Problems with their dismantling today and the conflicts that arise are caused by the fact that the owners and tenants of illegal constructions fail to respond to notices of the need to dismantle the kiosks, which are illegal. We warn them and provide all the documents." Read alsoCentury-old mansion unlawfully demolished downtown KyivKyiv mayor also noted that a unified architectural design for all kiosks will be adopted next year. In turn, the prosecutor general said that he fully supports the mayor’s policy on the elimination of illegal kiosks. "It is beneficial to all - the city and to the people living in Kyiv. Dismantling must be carried out by legal means,” he said. Lutsenko recalled the events outside KPI subway station where kiosk owners and communal services clashed over the dismantling procedure. The prosecutor general criticized Kyiv police for failing to ensure public order and also the communal services for the damage inflicted to kiosks.